High Court Karnataka Notification is out. High Court Karnataka is recruiting for 834 Oath Commissioner Post Posts. 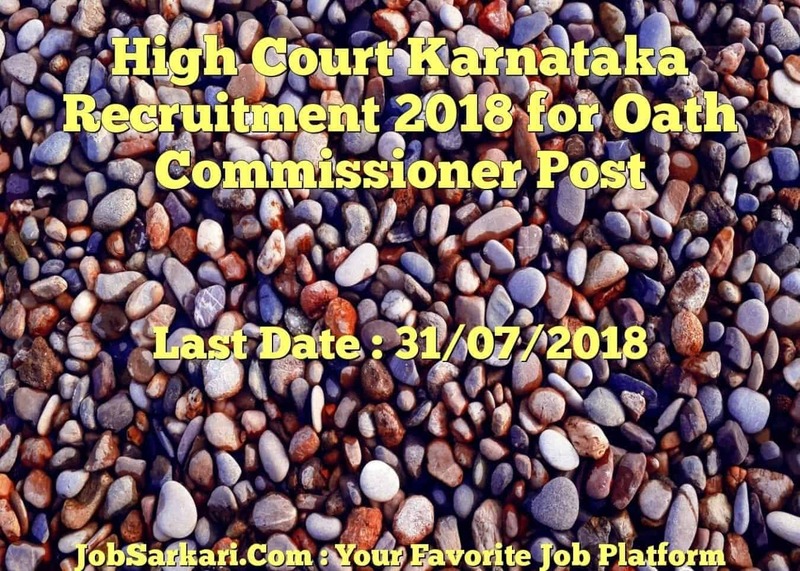 You can check High Court Karnataka - Karnataka High Court last date, download High Court Karnataka notification, visit High Court Karnataka official website and check other High Court Karnataka Vacancy details.Complete Vacancy and recruitment Details about 834 Oath Commissioner Post vacancies in High Court Karnataka are provided below by JobSarkari.Com only for you. Last Date for Apply Online 31/07/2018. Total No of Post 834. Candidate Must Have Passed Graduation Degree in Law and Practicing as an Advocate from 2 Years and Not More than 04 Years as on 13/07/2018 are Eligible to Apply. Not Exceeding 35 Years as on 13/07/2018. 3.Click the Online Application Tab Given on the Top of the Notification. 4.Read all the Instruction Carefully and Tick the Checkbox to Proceed for Application Form. 5.Fill All the Mandatory Details in the Application Form. 6.Upload the Scanned Copy of Passport Size Photo with white back ground(Upto 50kb) and Signature on white paper in black ball point pen(Upto 25kb) in JPG Format. 7.Take Printout of Your Application form for Future Reference. 8.Online Application Can be Submitted on or Before 31st July 2018. Q. What is the Last Date For High Court Karnataka Oath Commissioner Post Vacancy ? A. 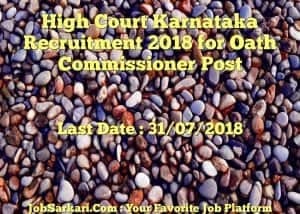 Last Date for High Court Karnataka Oath Commissioner Post Posts is 31/07/2018. Q. What is the Form Type of High Court Karnataka Oath Commissioner Post Recruitment ? A. The Form Type for High Court Karnataka Oath Commissioner Post Posts is Online. Q. How many vacancies are available in Karnataka High Court Oath Commissioner Post Posts ? A. There are about 800 Vacancies in Karnataka High Court Oath Commissioner Post Posts. Q. What is the Full Form of High Court Karnataka ? A. Full Form of High Court Karnataka is Karnataka High Court .